October is Breast Cancer Awareness Month and there are several organizations, retailers, and friends who are hosting fundraisers to support breast cancer research. Money is a powerful force and can really help to advance breast cancer treatment, prevention, and care, so choosing where to donate yours is an important decision. Before you do, make sure that the organization or brand fits in with your values, and has a reputation for following through on their promises. And keep in mind that breast cancer awareness and health goes beyond just one month. October is a wonderful time to start participating financially, but it's not the only opportunity. Breast cancer survivors, researchers, and loved ones dealing with loss need your encouragement and financial donations all the time - not just once a year. You can support this cause and raise awareness all year round. Want some ways to get started now? From clothing to connection, check out these ideas below! There are many amazing projects helping to (literally) expose breast cancer and raise public awareness of the needs of those going through it. You can do your part, too. Wearing a t-shirt or clothing for the cause may feel simple, and it is. But purchasing these items often have numerous positive outcomes. First, some reputable brands partner with organizations to donate a portion of proceeds. That means you get to wear a dress and inspire positive action. Second, wearing something around friends and family can often open the dialogue and provide a way to discuss a delicate topic. There are several companies with Breast Cancer Awareness merchandise. 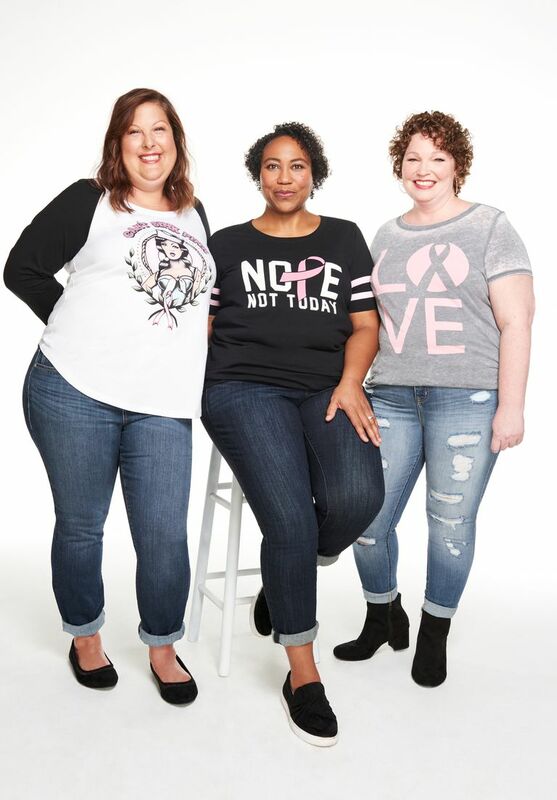 One of these is Torrid, a contemporary plus size retailer that is partnering with the National Breast Cancer Foundation in an effort to raise money in the fight against breast cancer. Torrid customers can donate to the organization directly. For every $10 donation in store, customers will be gifted a limited-edition breast cancer awareness tote, while supplies last. Additionally, the purchase of breast cancer awareness products (20% will support the foundation), including a t-shirt collection, intimates, and Hello Kitty-inspired active wear. Lastly, customers can round up purchases to the next dollar to donate to the foundation. The merchandise is available at Torrid.com and in-stores. Breast Cancer Research Foundation has an entire list of participating brands and products to choose from, including clothing, home goods and so much more. Pay it forward jewelry collection The Giving Keys is donating 10% of the proceeds from the sales of the SURVIVOR Key towards Susan G. Komen. Footwear brand Timberland created a special collection of women's, kids' and men’s boots to benefit the cause. Regardless of sales, Timberland will donate $50,000 to Susan G. Komen this year. Be sure to research the companies and causes that align with your values and are working toward the prevention or research. One of the most fitting items to purchase: bras! Whether you have had a mastectomy, undergone reconstruction, had a lumpectomy, or have your natural breasts, you can support Breast Cancer Awareness month while bra shopping. For over 17 years, bra manufacturer Wacoal has hosted its Fit for the Cure campaign in department stores across the USA. For every person who comes in for a bra fitting, Wacoal donates $2 to Susan G. Komen® to benefit breast cancer research, care, and community health programs. And for every Wacoal or b.tempt’d item purchased during the event, Wacoal donates an additional $2. For the month of October True&Co. is donating 25% of sales of all Retro Pink True Body styles to the Keep A Breast Foundation. AnaOno, which was created by a fashion designer who has undergone mastectomy surgery herself. The brand creates undergarments and loungewear specifically for those who've had breast reconstruction, breast surgery, mastectomy or are living with other conditions that cause pain or discomfort. Plus, they have an ongoing partnership with Pink Warrior Angels to provide support and bras to breast cancer patients in need. Purchase a Breast Cancer Awareness gift for a friend or loved one whom you want to learn more about prevention. Send a post-surgical bra, robe or another clothing item to a friend who is a survivor. Whether she is currently undergoing treatment or not. This kind of gift lets her know that you're aware that her fight with this disease did not end with her last chemo treatment, and neither did your support. Donate to a cause or charity in someone's memory. Attend a fundraiser or gala with your friends or colleagues. Even learning how to talk about cancer - especially breast cancer - among your peers is a big step toward ousting the taboo behind this kind of cancer. Plus, your donations can help the prevention and treatment of it. Send a gift card for meals to a family who is dealing with breast cancer treatments so they can put their funds and energy into healing their loved one. The best way to contribute to research, prevention, and treatment is by giving directly. That way, a much larger portion of your dollar amount is going toward practical progress, instead of a small proceed of profits. Beware, though. The breast cancer awareness has become well known. That also makes it a target for charity scammers who may say they are taking donations for a cause, and are actually pocketing most or all of it for themselves. And, some organizations are more transparent with how they distribute their funds. Do your research and make sure your money is going toward a cause you can truly support. National Breast Cancer Foundation Inc. - This organization provides education, along with free mammograms and other cancer resources for those in need. They provide: "breast health education to those learning about their risks, early detection services to those in need, and a helping hand to those diagnosed with breast cancer and their loved ones as they navigate the complex cancer care system." Susan G. Komen - Started in the 1980s, this well-known organization's mission is to help save lives and end breast cancer. Through fundraisers and awareness, they reach many people with vital information and hope. Keep A Breast - Since 2005, this organization has been educating young people with breast health education early on in their lives, "by talking to them face-to-face about breast cancer in their own voice and on their own turf." Breast Cancer Research Foundation - The mission of this foundation is to prevent and cure breast cancer by advancing the world's most promising research.